Every alarm panel needs your input to tell it what to do. This can be done via a keypad or a key fob. Some keypads have an actual alarm system inside and are ideal for residential use. Motion sensors, door sensors, smoke detectors, heat detectors and carbon monoxide detectors are wirelessly connected to it. You can arm and disarm your panel by using your 4-digit code or with a key-fob. The siren is built into the keypad. With the latest alarm panels we can set you up for a “two way audio” account. That means that someone from the alarm reporting center can talk with you through your keypad. We can upgrade your older DSC panel with a new keypad that has a wireless receiver built into it. So with this new keypad, you can add more wireless devices to your panel. We can upgrade your alarm panel with a newer board If you like to make your panel compatible with the newer functions like “two-way audio”. Off course, your alarm panel needs to be hooked up to a phone line so that it is able to send the alarm signals to the alarm reporting center. But what happens when your phone line is cut off? 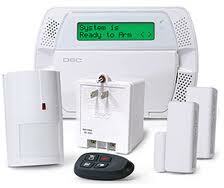 You can make your house or office more secure when you give your alarm panel a Cellular Back-up. In case your regular phone line is cut, your Cellular Back-up unit is already communicating with your alarm reporting center that your phone line or power is disconnected, making you that much safer.